Ok, first of all, this may not mean anything to some of you... but I have had a blogging epiphany, and it is called Firefox. I just downloaded it, and all of my blogging woes are gone forever. Blogger is a hundred times faster and more reliable in Firefox. I am in awe. I believe my father told me of the joys of Firefox, but I did not listen... oh, if only I could take back the hours of my life I wasted on Internet Explorer, waiting for a photo to upload only to find that it hadn't worked...what a waste. On with the real reason I'm writing... I need to introduce you to my housemates – my surrogate family in Vancouver. They look rather scary in this picture, but I assure you, they're not dangerous. Danice (dance with an “i” in the middle) you may remember from last year’s blogging. She is a fellow Regent student, studying to be the really incredible youth pastor that she already pretty much is. She dances like Michael Jackson. Danielle is studying liberal arts at UBC and mostly enjoys making time-lapse videos. I like stealing M&M peanuts from her jar. Lindsey is studying Native people and coordinating the production of a TV show about Aboriginal athletes. She makes me tea. All of them are from places close to Vancouver. All of them are lovely. 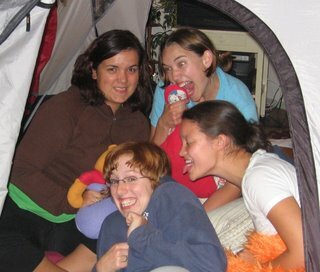 We decided to celebrate our housemateness by having a camp night. In other words, Danice had to air out her tent, so we set it up in the middle of the living room. The best part of camp night was definitely the smores. 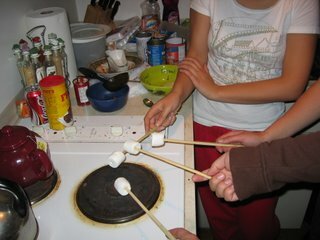 We roasted marshmallows on chopsticks over the stove element (thanks to Tora for this idea!). We didn’t have graham crackers, so we used arrowroot cookies – you know, the ones that are always in the closet of the toddler room at church. We spent a good amount of time singing campfire songs. Actually, they were Beth-songs. Songs in which you replace a word that sounds like “Beth” with “Beth”. For example… “You take my Beth awaaaaay…” and “You’re simply the Beth” and “Baby boy make me lose my Beth” and “Every Beth you take”. It’s a good thing that so many songs can become about me, because if you’re trying to write a song about me, I warn you, my name is very hard to rhyme with anything. So far, the only rhyming words for “Beth” I’ve thought up are “breath” and “death”. And, as Jared so helpfully pointed out this summer, “crystal meth”. After a brief but vicious pillow fight, we put the tent to good use by laying in it and watching a movie through the door. The movie was Labyrinth, a movie from Danice’s childhood. I’m sure glad I didn’t watch this movie as a child. The title should have been “Some very disturbing Muppets with an even more disturbing David Bowie”. David Bowie was the King of Goblins, but mostly he wore tight pants and sang something like “Dance magic dance”. I am scarred for life. For those of you who are worried about the possibility of more rats in my house this year, I wanted to show you this picture to reassure you. Our landlords built this lovely little door to cover the hole in the wall where Melba the rat enjoyed entering our basement. Unfortunately, the door is secured by Velcro. I surmise that a rat who had the sense and strength to chew through packing tape and Tupperware last year could push open a Velcro-ed door this year, if it didn’t chew through the door itself. 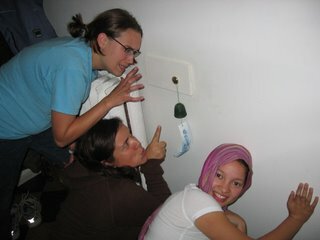 So when I received a decorative bell as a present from my Japanese friend Toshi, I decided to hang it on the mini-doorknob, so that when the rat pushes through the door, we will at least be aware of its presence.